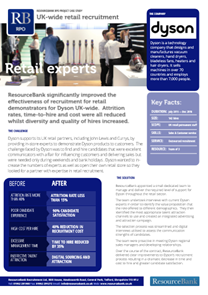 ResourceBank significantly improved the effectiveness of recruitment for retail demonstrators for Dyson UK-wide. 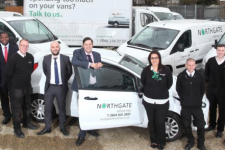 Attrition rates, time-to-hire and cost were all reduced whilst diversity and quality of hires increased. 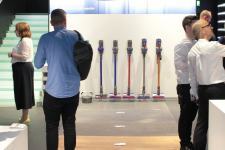 Dyson supports its UK retail partners, including John Lewis and Currys, by providing in-store experts to demonstrate Dyson products to customers. 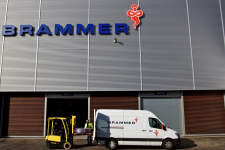 The challenge faced by Dyson was to find and hire candidates that were excellent communicators with a flair for influencing customers and delivering sales but were needed only during weekends and bank holidays . Dyson wanted to increase the numbers of experts as well as open their own retail store so they looked for a partner with expertise in retail recruitment. ResourceBank appointed a small dedicated team to manage and deliver the required level of support for Dyson throughout the retail sector. The team undertook interviews with current Dyson experts in order to identify the value proposition that the role offered to different demographics. They then identified the most appropriate talent attraction channels to use and created an integrated advertising and attraction campaign. The selection process was streamlined and digital interviews utilised to assess the communication strengths of candidates. The team were proactive in meeting Dyson regional sales managers and developing relationships. Over the course of the contract, ResourceBank delivered clear improvements to Dyson’s recruitment process resulting in a dramatic decrease in time and cost to hire and greater candidate satisfaction.